Shifting political alliances and new environmental challenges are prompting debate over processes of sub-regionalisation and whether the interplay between multiple scales of governance leads to positive synergistic outcomes or negative institutional disruption. Regional management of tuna fisheries in the Western and Central Pacific Ocean is an example where a web of treaties, conventions and institutional frameworks underlie international cooperation. Through examining the interplay between the regional Western and Central Pacific Fisheries Commission and sub-regional Parties to the Nauru Agreement, this paper explores the extent to which the PNA and WCPFC interact in the management of regional tuna fisheries. The results demonstrate that for contested marine resources such as fisheries, international sub-regions can go beyond functional units to also present wider opportunities to shift power relations in favour of small island states. Additionally, the presence of sub-regional groups like the PNA has served to challenge the performance of the WCPFC, stimulating greater debate and progress within the regional body. The paper concludes that the combined work of the PNA and the WCPFC puts them ahead on many issues and may represent a testing ground for a functional multilateralism utilising both regional and sub-regional governance platforms for the management of shared resources. The perceived crisis in the effectiveness of multilateral institutions has led to a new round of debate over the form and function of environmental international regimes, especially around complex environmental problems (Young ; Biermann et al. ; Conca ). While some scholars have gone so far as to suggest a complete disbandment of international regimes, others have focused on processes of sub-regionalisation in response to shifting political alliances and new environmental challenges (Balsiger and VanDeveer ; Balsiger and VanDeveer ). Questions are being raised as to what the most appropriate region or ‘scale’ of governance is, defined not only by the functional spatial extent of a resource or an ecosystem, but also by the social relations which produce and reproduce cooperation and ultimately governance (Paasi ). The process of sub-regionalisation is demanding new questions of how multiple scales of governance interplay with each other leading to positive synergistic outcomes or negative institutional disruption (Young ; Oberthür and Stokke ; Van Leeuwen and Kern ). It also questions the extent to which conformity or conflict of interests can be resolved and lead to governance innovation (Young ). Regional management of tuna fisheries in the Western and Central Pacific Ocean (WCPO) is made up of a web of treaties, conventions and institutional frameworks that underlie regional cooperation (see Tsamenyi ; Tutangata and Power ; Wright et al. ). The main regional fisheries management organisation (RFMO) is the Western and Central Pacific Fisheries Commission (WCPFC), formed under the United Nations Convention on the Law of the Sea (UNCLOS). Additionally, two treaty-defined sub-regional bodies that pre-date the WCPFC, the Parties to the Nauru Agreement (PNA) and Pacific Islands Forum Fisheries Agency (FFA), are also involved in tuna fisheries management (see Figure 1). However, unlike regional architectures in other environmental governance regimes, such as the climate governance regime (e.g. Biermann et al. ), these two sub-regional bodies supported the formation of the regional WCPFC. The complex set of governance and institutional arrangements that manage tuna fisheries in the WCPO have been referred to as some of the most sophisticated sets of cooperative tools in the world (Hanich et al. ), providing a variety of normative structures from which a range of international and domestic conservation and development policies emerge. Institutional map of the regional and sub-regional governance regimes in the West and Central Pacific Ocean (Adapted from Parris[2010a]). Despite being the youngest of the seven RFMOs, the WCPFC has been described, with various qualifications, as one of the most successful in terms of regulating oceanic tuna and billfish species (Cullis-Suzuki and Pauly ; Aranda et al. ). However, its critics maintain that many of the conservation and management measures (CMMs) the RFMO has generated are insufficient, and that the institutional practices of the WCPFC lack transparency (Parris [2010a]; Gilman and Kingma ). Amidst such debate over the effectiveness of the WCPFC, the PNA (made up of Federated States of Micronesia, Kiribati, Marshall Islands, Nauru, Palau, Papua New Guinea, Solomon Islands and Tuvalu), has received conspicuous support from academics and NGOs alike for their recent successes in agreeing on and implementing CMMs, new access arrangements around a vessel day scheme (VDS), and the successful Marine Stewardship Council (MSC) certification of free-school purse seine skipjack tuna fisheries in 2012. However, some WCPFC members, like the EU, have criticised the emergence of the PNA as a competing sub-regional fisheries management body that limits wider regional coherence. Most analyses of governance strategies for tuna fisheries in the region have focused on the trade-offs and complementarities between multilateral cooperation vs. domestic strategies in terms of management and economic development (Parris and Grafton ; Barclay and Cartwright ; Parris [2010a],[b]). Other questions have focused on models of Pacific regionalism that enable cooperation and capacity for effective engagement in the “global ocean community” (Tutangata and Power , p. 883). Less attention has been given to a better understanding of the roles of the PNA and WCPFC, how they interact and what influence each has over the governance of tuna in the region. If the goal is to create management systems that are sensitive to the spatio-temporal complexity of fishery resources (Wilson ), then can the interplay between regional and sub-regional management platforms lead to innovative management outcomes? What is the relationship between regional and sub-regional bodies? Do sub-regional groupings like the PNA present a means of stimulating innovation and change towards greater effectiveness at the RFMO level, do they make them less effective, or is there combination of both? We explore how the PNA, as a sub-regional body, has been able to be more experimental in developing tuna fisheries conservation and management measures, how durable the outcomes of this experimentation are in terms of providing long-term change, and ultimately the extent to which the PNA and WCPFC interact in the management of regional transboundary tuna fisheries. The interplay between these different scales of environmental governance in Western and Central Pacific tuna fisheries offers a relevant and timely lens to understand how these two scales of governance interact and what influence they have over each other in terms of creating innovative and effective management outcomes. More specifically, we ask what implications a shift toward sub-regional governance holds for the distribution of decision-making power between the PNA and WCPFC over ongoing contested management issues. The research is based on attendance at the 9th WCPFC Meeting 2012, where one of the authors participated as a volunteer with the Secretariat, the contribution of all three authors in a European Parliamentary hearing in part focusing on the effectiveness of PNA conservation and management measures, and an in depth a review of WCPFC documentation. In addition we interviewed four WCPO regional experts to follow up on specific points of clarification. The paper begins with an introduction of key questions asked around regional environmental governance. We then turn to a discussion of the emergence of sub-regional governance in the context of transboundary tuna fisheries before going into a detailed description of the multi-level architecture of fisheries governance in the WCPO. Our analysis then focuses on the tensions that exist between the WCPFC and PNA in setting fishing reference points, administering CMMs and balancing the interests of their respective members. Finally, we return to the implications of sub-regionalism in the WCPO and what implication it holds for governance regimes such as RFMOs aimed at innovative governance for the long-term sustainability of transboundary and high seas tuna fisheries. In resource governance terms, regionalisation is often referred to as a politico-administrative process of establishing spatially defined scales of management that devolve decision-making and create more responsive and adaptive management decisions (Symes ; Balsiger and VanDeveer ). Although there is often an aspiration to base the definition of a region on the geography of a resource, it can also be based on a process of regionalisation; referring to the socio-political exercise of creating new political territories (Symes ). This can entail either moving ‘down and out’ through the decentralisation of administrative functions and the devolution of decision making (e.g. co-management), or moving ‘up and in’ through centralisation and concentration to an aggregate scale (e.g. the EU or RFMO) (Oberthür and Stokke ). Examining fisheries regionalism therefore opens up questions about the political and economic rationale for creating functional and geographic scales of management on the basis, for example, of resource use sustainability. In the case of fisheries, the strength of regionalisation and regionalism varies according to how the geography of fishery resources and relevant political scales are brought together. The realisation of regional cooperation over marine resources began with the lead up to the formulation and ratification of UNCLOS, under which ‘global’ transboundary fisheries, defined by their ecological extent spanning exclusive economic zones (EEZs) and the high seas, were divided into functionally defined RFMOs (Valencia ; Morgan ). Since then functional approaches to marine regionalisation and governance have based themselves on a mix of treaty-based agreements, such as the EU Common Fisheries Policy (CFP) and the Palau Agreement in the Pacific (Tsamenyi ; Symes ), and alternative ecosystem-based regional configurations, such as large marine ecosystems (LMEs). LMEs, for instance, are an attempt to combine geographical scales of the marine environment with functional administrative scales of management (Vallega ; Fanning et al. ). The 2012 reforms to the EU-CFP raised a heated round of debate about the role of regionalisation within European seas. Paralleling discussions of multi-level governance, regionalisation in the EU is seen as a process of ‘moving down’, thereby enabling lower level authorities to take control of tailor-made management for particular spatial areas, and ‘moving out’, referring to the increased involvement of private actors in fisheries management (Raakjaer and Hegland ). The exact institutional design of regional fisheries management in the EU is still under debate, with proposals ranging from sub-EU RFMOs (as distinct from UNCLOS defined RFMOs) to nationalisation (Hegland et al. ). Ultimately this represents a wider double-movement; the creation of common pool management by centralising management at the EU level through the CFP and a political process that decentralises control to formal (geographical) and functional (administrative) sub-regions (Symes ). In the Western and Central Pacific, the potential for political sub-regionalisation has been proposed by Hanich et al. (). Under their model the administrative burden imposed on Pacific Island countries by the various supra-national treaties, such as the PNA and WCPFC, would be mitigated through joint management by sub-regional groupings of three or four Pacific Island countries. This is nowhere more relevant than in the WCPO where 40 (WCPFC) member and non-member states make up a mix of states with sovereign interests over the resources in their EEZs and states with distant water licences to fish in these EEZs. There are also joint interests of all states over the four WCPO high seas pockets, international waters enclosed by EEZs (see Figure 2) (Tsamenyi ; Hanich ). These interactions have led to a complex multi-level interaction, with scientific input from the FFA and Secretariat of the Pacific Community (SPC), of treaties and measures such as the Harmonised Minimum Terms and Conditions of Access for Foreign Fishing Vessels, the VDS, the FFA Vessel Monitoring Scheme and the Niue Treaty to manage transboundary stocks (see Hanich et al. for detail). Hanich and colleagues argue that a collective sub-regional strategy would require states to “pursue their own national interests within their vision of a collective strategy” (p. 89) under a sub-regional collective management authority that would act on behalf of sovereign states to administer licencing or access arrangements in their EEZs. WCPFC Area and corresponding EEZs. The areas numbered 1 to 4 correspond to the high seas pockets. Pockets 1 and 2 are closed to purse seine fishing since 2010 under the WCPFC. Pockets 1 to 4 are closed to any purse seine vessels licensed to fish within the EEZs which are part of the PNA”. Timeline illustrating the developments in WCPO fisheries governance from 1979-2011. These different models emphasise the importance being given to regionalisation and regionalism in the marine environment, which as noted by Symes () is made all the more complex by how the “shifting distribution of fish populations and the dynamic nature of ecosystems … [make] natural boundaries … both permeable and unstable” (p. 87). As he goes on to argue, under such changing conditions, “regions are bound to be socially constructed rather than naturally occurring and their boundaries inevitably reflect a compromise between overlapping sets of distributions and ecosystems.” (p. 87). This very contestation opens up questions on the performance and interplay between different regional scales of management. The proposals of both the EU and the governing bodies in the WCPO provide a set of (explicit and implicit) normative goals for sub-regionalisation: subsidiarity provides more adaptive management; decentralisation and participation leads to more effective decisions; improved implementation can meet sustainability and development goals of nation states. But while sub-regionalisation has the potential to create geographically, ecologically and administratively effective platforms, there is nothing to say that smaller regional groupings would always improve control of fishery resources or create adequate incentives for meaningful cooperation that would lead to more sustainable outcomes. We have identified four interrelated factors that can be used to evaluate the specific outcomes of the process of sub-regionalisation and the interplay between regional levels: scale, the creation of normative structures, conformity vs. divergence of interests, and incentives for cooperation (see Table 1). Scale refers broadly to the spatially and temporally bounded extents at which a natural or social phenomenon is observable (Cash and Moser ). In resource management terms scale also refers to the spatial and temporal extent at which institutions are set and socially or politically organised (e.g. local, national, global) – as such they are social constructs open to politicisation (e.g. Meadowcroft ; Swyngedouw ). For example, scale helps to identify ideological motivation for the definition of a ‘region’: a social and political construct created to include and exclude actors from a resource or decision making process through the mobilisation of biophysical, political-administrative, socio-economic, or cultural-symbolic dimensions (Balsiger and VanDeveer ). Scale therefore presents an institutional design challenge – ensuring that management institutions and the organisations tasked with their oversight are set at levels that are concordant with the social, political and ecological extents they govern (Cash et al. ). Following Young (), one key strategy for ensuring concordance, especially when there are multiple scales of governance, is institutional interplay; where governing functions are distributed among regimes located at higher and lower levels on the jurisdictional scale (see also Cash et al. ). This institutional interplay also covers the potential of upward or downward transfer of governing innovations between levels. Underscoring the creation of normative structures that govern control over transboundary fishery resources by states and fishers alike are tensions between resource access, sovereignty and economic development. Although functionally specific regional bodies may have a higher degree of legitimacy than non-specific bodies, participation and control remain centrally political issues – especially when dealing with perceptions of equity and justice (Lebel et al. ). The challenge for these regional bodies is therefore to maintain a degree of inclusiveness and cooperation while effectively reducing the complexity of addressing multiple interests. The complexity of regional-level governance requires a balance of multiple state and non-state parties’ interests. In models of sub-regionalism that move down in scale and out to include a wider range of actors, subsidiarity and democratisation of decision-making are core principles (Raakjaer and Hegland ). But in many other contexts sub(-national) regions may not be feasible or politically desirable, and increased participation may exacerbate existing (political) complexity in rule making and implementation. Instead, sub-regionalism may also involve a shift of power to a smaller group of actors that reduce participation of other parties in order to capture control over fishery resources. Returning to Young (), it is again the interplay between scales of governance, represented by functional regions, that determines the extent to which the conformity or divergence in the interests of different actors can be resolved. Finally, the distribution of costs and benefits of conservation influence the degree of and incentives for cooperation within and between particular regions. The common assumption is that fisheries sub-regionalism is underscored by adequate incentives for cooperation. However, as Bailey et al. () note, the theoretical evidence for cooperative governance arrangements of fisheries, including tuna fisheries, is in stark contrast to their successful implementation. The voluminous literature on cooperation around tuna fisheries in the WCPO focuses on how ‘resource rent rivalry’ has been driven by a combination of competition for access by distant water fishing nations (DWFNs), the dependency of many Pacific Island countries on tuna for national income, and aspirations for domestic social and economic development (Campbell ; Barclay and Cartwright ; Havice ; Parris [2010b]; Havice and Reed ; Gagern and van den Bergh [In Press]). Incentives for cooperation around tuna, like many other marine fishery regions around the world, are therefore underlined by the need for generating domestic wealth from shared resources – which under pressure from divisive treaties and aid relations represents an archetypal prisoner’s dilemma. The degree to which regional management bodies can establish (re)distribution mechanisms of this wealth, and the strength of these mechanisms in the face of strong external pressure provides an indicator for on-going cooperation. The balance between regional and sub-regional governance in WCPO tuna fisheries opens up a discussion on the architecture of effective arrangements through the interplay between these different scales of governance. 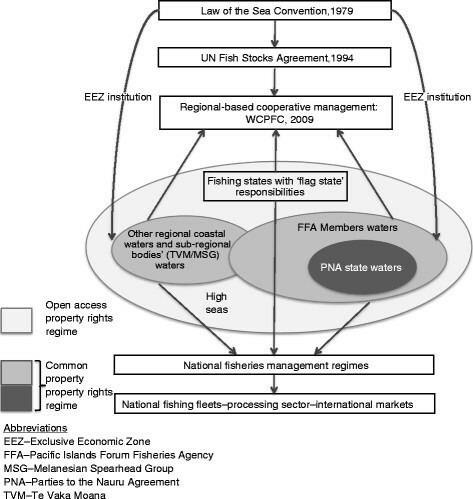 The rest of the paper explores this interplay between the WCPFC and the PNA as two regional fisheries governance arrangements, their effectiveness in responding to complex fishing practices that operate at different ecological and political scales, and the potential of regionalism to act as a driver for innovation in regional and sub-regional sustainable fisheries governance. The WCPFC was established in 2004 after the Convention for the Conservation and Management of Highly Migratory Fish Stocks in the WCPO was ratified by 17 member states. The WCPFC is based on an international fisheries agreement that aims to foster the long-term conservation and sustainable use of highly migratory fish stocks in the WCPO. Reflecting the complexity of multilateral platforms, the Commission holds the potential to represent the interests of 65 states (as listed in Annex A of the Convention), but until now has been limited to 25 members, seven participating territories and nine cooperating non-members and observers. In addition the WCPFC has three technical subsidiary bodies that meet annually, before the full session of the Commission: the Scientific Committee, the Technical and Compliance Committee, and the Northern Committee. Unlike all other oceans and tuna RFMOs that predominantly cover fisheries in the high seas, WCPFC covers both coastal states’ EEZs and the high seas. This places those states whose EEZs fall in the Convention area in a position of power regarding decision-making at the WCPFC but adds further to the complexity of this governing body. Three sub-regional groups, that preceded and were responsible for creating the WCPFC, are the SPC, the FFA, and the PNA. All three bodies closely coordinate their activities through joint participation in regional meetings involving their members and more formal annual consultations between the Secretariats. While the SPC plays a more neutral role by providing independent scientific stock appraisal information and advice to Scientific Committee members, the FFA and PNA are multilateral sub-regional governance bodies that over time have developed different levels of advisory and regulatory authority. The FFA was established in 1979 in response to changes resulting from the third Law of the Sea Conference (see Tsamenyi ). The main role of the FFA is as an advisory and support body to 17 Pacific Island countries – who are also members of the of the Forum Fisheries Committee (FFC) in the WCPFC – targeting sustainable management of fish stocks in their states’ EEZs while also maximizing their social and economic benefits. The FFA does not have any authority to enforce the decisions of its governing council: all member states maintain sovereign control over fisheries in their EEZs and archipelagic waters. Instead, the FFA provides support to Pacific Island countries by facilitating capacity building and regional cooperation through providing technical and policy advice to its members participating in international forums like the PNA and WCPFC (Langley et al. ). The PNA came into force in 1982 with the objective of member countries controlling the terms and conditions of allowing foreign fishing vessels in their EEZs (Nauru Agreement ). Their role strengthened in 1992 under the Palau agreement, which set arrangements for regular management meetings for tuna stocks and established the role and responsibilities of the PNA office. Since its establishment, the PNA has produced a series of measures that have reinforced their control over tuna fisheries throughout their EEZs. As summarised by Havice (), this was first seen in 1994 when the PNA countries reduced foreign purse seine licences by 10 per cent and reallocated them to domestic/locally based vessels. In 1995, they then developed the FSM (Federated States of Micronesia) Arrangement for Regional Fisheries Access, which gave vessels from PNA countries discounted fishing licences and reciprocal access to all PNA waters. After the WCPFC was established, the PNA has continued to create its own access arrangements and management systems. In 2010, PNA members signed the Koror declaration underlined by the PNA Implementation Arrangements, which confirmed support for a range of far reaching fisheries management measures. These were: the purse seine Vessel Day Scheme (VDS), which allocates days to member countries who then distribute them to distant water fishing nations (DWFNs) based on their licencing agreements; high seas pocket closures as part of EEZ licensing arrangements (see Figure 2); establishment of Minimum Terms and Conditions for foreign vessels; seasonal closures for the use of fish aggregating devices (FADs) (Palau Arrangement ); catch retention measures; and a regional observer programme for purse seine vessels (Shanks ; Havice ). The PNA also created an independent secretariat to administer control over the Implementation Arrangements, most notably the purse seine VDS, and the MSC certification of the free-school (non-FAD) skipjack fishery that was obtained in 2011. This strengthening of the PNA’s regulatory capacity responded in part to the perceived increased power of the DWFNs under the WCPFC Convention. The PNA is therefore a functionally important sub-region in the WCPO, with a clear mandate for management aimed at both domestic economic development and at the sustainability of their tuna resources. Demonstrating a case of upward transfer of governing innovations, the PNA is promoting the uptake of innovative management measures at the WCPFC level with the aim of increasing the functional scale of governance across all tuna in the Western and Central Pacific. Given the unique experience of RFMO formation in the WCPO, and the persistence of sub-regional groupings like the PNA, we now turn to a comparison of these two scales of governance, exploring the relative success each has had in tuna management and their influence on each other’s overall performance (Figure 3). The interaction of the WCPFC and the PNA on specific points of fisheries governance is illustrative of the tensions, both creative and constraining, between the two regional bodies. The following section examines three examples where they have influenced each other’s performance in terms of establishing reference points; designing and implementing CMMs and the distribution of the conservation burden; and defining spatial jurisdiction through changing access arrangements to high seas pockets. In fisheries, taking a precautionary approach involves management policies and strategies that account for the risk of overexploitation given uncertainties in assessing the status of fish stocks and fishing pressures. Guidance on the application of the precautionary management of highly migratory and straddling fish stocks was introduced in Annex II of the United Nations Fish Stocks Agreement (UNFSA) in 1995. Fundamental to this approach is setting and employing two reference points for fisheries management: a limit reference point aimed at constraining catch within safe biological limits; and a target reference point aimed at meeting management objectives, such as desired biological, social, and economic outcomes. The WCPFC provides for the application of the precautionary approach. The Commission is currently developing reference points to inform the development of operational objectives and performance measures for longer-term management strategies. At the 9th Regular Meeting of the WCPFC, members agreed upon limit reference points, according to recommendations from the SPC. Special mention was also given to the WCPFC prior to the meeting on their application of the precautionary approach in the WCPFC Performance Review, which stated “The Commission and Scientific Committee are to be commended on progress made in developing limit reference points, particularly for bigeye, skipjack and yellowfin” (WCPFC [2012c], p.157). The WCPFC is ahead of most other tuna RFMOs on this: the Inter-American Tropical Tuna Commission (IATTC) is currently the only other RFMO that makes explicit reference to the application of the precautionary approach and the use of reference points (de Bruyn et al. ). Therefore, compared to most other RFMOs the WCPFC is among the leaders in advancing the development of a formalised precautionary approach framework. In spite of the WCPFC’s comparative progress, the PNA are also looking to take the lead toward setting both limit and target reference points, should the WCPFC fail to make progress with target reference points. The PNA’s concern about the WCPFC’s potential for implementing these reference points was highlighted during the MSC certification of the PNA free-school skipjack tuna fishery in 2011. One of the conditions of the certification pertained specifically to setting both limit and target reference points for skipjack stocks in PNA waters within five years of the certification. Initially, there was pressure from non-PNA actors engaged with the certification procedure for WCPFC to be responsible for setting these limits. However, one PNA official described how they fought this because, “if it became a Commission initiative and had to be decided under consensus, all it would take would be for one party to block it and we would lose the certification”. Instead, the PNA negotiated that either “PNA and/or WCPFC” could take the initiative on setting the reference points. The official argued that the PNA would go ahead with setting both reference points, while maintaining an option for deferring overall responsibility to the Commission, should they fail to reach an agreement. The position the PNA takes on this issue is telling for a number of reasons. Firstly, it provides evidence of the difficulties that have been faced in negotiating regional measures through the WCPFC, particularly in terms the conflicts that arise from consensus voting. Secondly, it demonstrates a degree of PNA dependency on the WCPFC, should they fail to agree amongst themselves on applying limits to their shared fishing resources. Finally, the condition for setting both target and limit reference points came from the MSC certification procedure and illustrates the extent to which external market-defined sustainability concepts can steer state-based decision-making. Under the WCPFC, the primary CMM concerning bigeye and yellowfin tuna was agreed on in 2008 (CMM-2008-01). Broadly speaking, it covers purse seine effort limits both within the EEZs of coastal states and in high seas pockets, longline effort limits and seasonal FAD closures. However, under Article 30 of the Convention, it underlines “the need to ensure that such measures do not result in transferring, directly or indirectly, a disproportionate burden of conservation action onto developing States Parties, and territories and possessions” (WCPFC  p.19). This is reiterated in Paragraph 6 of the CMM where, “Unless otherwise stated, nothing in this measure shall prejudice the legitimate rights and obligations of those small island developing state members and participating territories in the Convention Area seeking to develop their own domestic fisheries” (WCPFC  p.3). These clauses attempt to accommodate what Hanich () has labelled the ‘conservation burden’ associated with small island developing states’ implementation of CMMs. Acknowledging the different status of Pacific Island countries, the implementation of CMMs has been accomplished through the incorporation of a number of exemptions, including: 1) no limits on bigeye catch by domestic longline fleets; and 2) exclusion of archipelagic waters from CMMs (Parris [2010a]). These exemption clauses could be problematic from a sustainability perspective because they could mean a substantial portion of the tuna industry may remain unregulated under the WCPFC and therefore undermine the effectiveness of the CMMs. Thus far, the so-called exemptions-based management approach, has not led to measurable improvements in the fishery. In fact, the PNA have rapidly increased their fishing mortality above their 2004 levels for the years 2005–2007 (Parris [2010a]). Concern has specifically been raised around the access of foreign (Philippine) vessels to Papua New Guinea’s EEZ, as part of licence agreements that are aiming to develop processing capacity, and the poor regulation of domestic fishing activities within their archipelagic waters (Hamilton et al. ). In spite of indications that the PNA fails to act in a way consistent with the sustainable management of fish stocks when it comes to the implementation of WCPFC CMMs, outside the Commission it is providing a platform for developing and implementing innovative management measures for its purse seine fisheries. These include FAD closures and high seas pocket closures. As evidence of PNA’s leadership in this regard, the Commission has since adopted both these PNA measures. The result is a trade-off between Pacific Island countries calling for special consideration under Article 30 to reflect their conservation burden, while at the same time developing innovative CMMs, some of which have been taken up by the WCPFC. At the 9th Regular Meeting of the WCPFC in 2012, continued reference was made to Article 30 when negotiating the terms of the new CMMs. An example of this was during discussions about expanding the length of seasonal FAD closures for the purse seine fishery. There was firm resistance from some of the smallest Pacific Island countries on the basis that this discriminated against the purse seine fisheries, which provide their primary source of income. They argued that longer closures than those already in place would be economically devastating, owing to national dependence on revenue from the sale of purse seine vessel days. Citing Article 30 and the conservation burden, they explained that they were already experiencing revenue loss from the 800mt of tuna ‘saved’ (not caught) because of the existing closures. And therefore, they would need compensation for additional closures and/or evidence that longliners, that were not included in the CMM, were also having effort restrictions placed on them. The economic advantage the PNA states currently hold through revenue from the purse seine fishery operating in their EEZs provides an incentive to support measures that distribute much of the conservation burden onto longline fleets (Hanich ). As longline fleets fish primarily on the high seas, PNA states do not stand to benefit significantly from their activities and therefore want emphasis to also be placed on managing their effort. This also encourages them to oppose conservation measures that do not distinguish between high seas and EEZs, or apply new measures over their EEZs. Therefore, on the one hand the PNA is ‘feeding’ measures they have developed up to the commission level but on the other hand, under Article 30 there is also the option to retain control over the implementation of these measures to ensure the conservation burden is not transferred back to them. This reinforces the strong negotiating position of the PNA. However, there has also been resistance among some WCPFC Members over the PNA’s role as leader in the sustainable exploitation of its tuna stocks within the WCPFC. This is most evident when looking at the VDS. Some DWFNs like the EU have been reticent to fully endorse the scheme, on the basis that the PNA is insufficiently transparent about how they are allocating vessel days and of evidence that PNA members were overspending their allocation of days (Havice ). In spite of this, the WCPFC Science Committee has indicated that the VDS has had positive impacts on data quality by improving log-sheet data and requiring 100 per cent observer coverage. This has contributed to providing the Committee with better information for their stock assessments. It also indicates that sub-regional management measures can have indirect benefits to regional-level governance. To date, the legal role of WCPFC is undefined given it has “no legal authority to allocate rights to fish in any manner that undermines the sovereign rights or sovereignty of coastal states” (Hanich , p. 226). 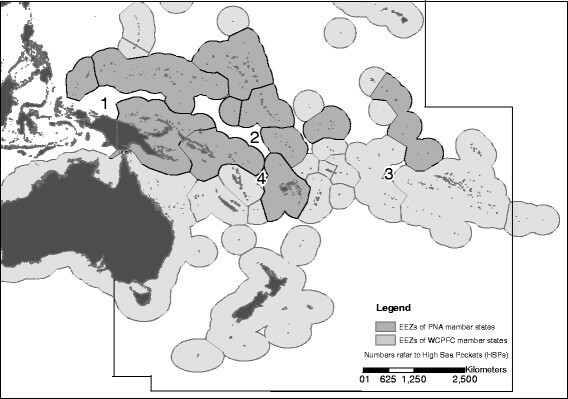 This has created a major tension in connection with wider issues of allocation of tuna between Pacific Island countries wishing to develop their domestic fishing capacity within their EEZs and the WCPFC, which is also responsible for management of fish stocks in the high seas (Langley et al. ). DWFNs want the measures agreed and set out by the WCPFC to apply equally across both the high seas and EEZs. They also want to see effort reduction measures in place that would counter any expansion of domestic fleets. The PNA have indicated they are amenable to these reductions but as one official stated, “on our terms”. Tensions between the PNA and the WCPFC over control of the high seas areas are illustrative of an underlying conflict between de facto and de jure definitions of spatial jurisdiction. The Convention provides the WCPFC with the remit to manage transboundary stocks across their full extent, including both high seas and EEZs in the Convention Area. In their 2012 CMM for bigeye, yellowfin and skipjack tuna, the WCPFC made it clear that “This Measure applies to all areas of high seas and EEZs in the Convention Area except where otherwise stated in the Measure” (WCPFC [2012b] p.5). The PNA maintains ownership over the resources in their EEZs, but not in the high seas. However, the PNA is extending control over the practices of distant water fleets, from states that are members of the WCPFC, in two distinct ways. First, they control these fleets by setting the adherence to CMMs for fishing in their EEZs. Second, the PNA countries have closed high seas fishing to DWFN vessels that have licences to fish in their EEZs. This represents a de facto extension of the PNA’s control beyond their spatial jurisdiction, and a spatio-legal challenge to the de jure control exercised by the WCPFC under UNCLOS. Under the 3rd Implementing Arrangement of the Nauru Agreement, the PNA agreed to close two high seas pockets to purse seining. The WCPFC subsequently adopted the closures through the CMM 2008-01, which came into force from January 1, 2010. Explaining “the serious impact on the bigeye stock from fishing by distant water longliners and purse seiners in the high seas and that the high seas continues to provide a safe haven for IUU fishing” (PNA  p.2), PNA leaders agreed to the closure of two additional high seas pockets to all purse seine vessels licensed to fish in the EEZs of the PNA in 2011 (Figure 1). Any licence granted to a DWFN to fish in the EEZs of a PNA member means the vessel cannot fish in these high seas pockets. On the basis that high seas pocket closures have shown no demonstrable decrease in fishing effort, and that in fact effort has been transferred to other areas (SPC-OFP ), Japan, the Philippines, Indonesia and the EU have opposed this CMM. Thus, when at the 7th Regular Session of the WCPFC in 2010, the PNA sought support from WCPFC to mandate the additional closures, it was rejected (Ride ). Further, in the 8th regular session of the WCPFC in March 2012, the Philippines negotiated access for 36 boats to High Seas Pocket 1 (see Figure 2). The position of the Philippines has been that the closures have put undue stress on their domestic fisheries and that the decision has led to increased fishing effort in its national waters. In exchange for the Philippine fishing access, the Philippine government is supposed to report its domestic and international tuna catch. Philippine vessels must also apply for international fishing permits before entering High Seas Pocket 1 and must allow 100 per cent regional observer coverage on board their vessels. It is notable, however, that civil society surveillance has indicated that not all Philippine vessels are complying with this (Greenpeace ). As the body responsible for introducing the closures, the PNA vehemently opposed this re-opening, insisting that the high seas pockets should remain closed permanently or at least until the Commission decides otherwise. However, the permission granted to the Philippine vessels still remains largely under the control of the PNA who have affirmed they will only licence DWFN vessels to fish in PNA waters if they voluntarily forego fishing on the high seas. Therefore, fishing will only take place by Philippine vessels and maybe a few other vessels that do not need access to PNA waters. Thus, in spite of the WCPFC ruling, fishing access remains primarily under the control of the PNA countries. This illustrates the contrast between PNA and WCPFC levels of decision-making and demonstrates the resilience of measures implemented and controlled at the sub-regional (PNA) level, especially when leverage over fishing access is involved. Whether and how innovation is occurring in the WCPO needs to be understood in the context of the on-going interaction between the WCPFC with the PNA and, although not our particular focus, the FFA. The WCPFC is different to other RFMOs because of the existence of these sub-regional groups, which provide an additional, meso-level of governance. We now turn to a discussion of the main factors that affect the emergence of (sub-)regional fisheries management in the WCPO and the effect regionalism has on the innovation of conservation and management measures over transboundary fishery resources. The powerful position the PNA has secured has meant that, unlike many global governance regimes, sub-regionalisation enables a process of feeding tested policy strategies upwards for regional implementation. The uptake of PNA policies at the WCPFC level indicates that, instead of representing a crisis point for multilateralism (Conca ), strong sub-regional governance has acted in part as a catalyst for regional policy convergence. It also appears to demonstrate a degree of scalar concordance; indicating that decisions over management measures are being distributed over levels most effective at dealing with the diverse interests of the actors involved (Cash et al. ). Additionally, through this convergence, the perceived legitimacy of PNA policies is further scrutinised by the wider global community associated with the WCPFC. The interplay between the PNA and WCPFC has therefore led to positive creative tension, as well as a greater degree of transparency and openness than would otherwise have been the case had governance remained at the more exclusive sub-regional PNA level. The results also indicate that the PNA’s high degree of functional control over the fishery has been translated into a political process of fishery regionalisation. Reflecting findings in other resource sectors (e.g. Balsiger and VanDeveer ), regionalisation has enabled the PNA to exclude some groups from decision making over resource access by mobilising biophysical, socio-economic and cultural symbolic dimensions of sustainable Pacific Island tuna fisheries. This is evident by their success in reinforcing the functional extent of the fishery with a perceived pro-active concern in the purse seine fishery (Hanich ), strategically using the institutional backing of WCPFC Article 30, and reinforcing their legitimacy through the MSC certification of the PNA free-school skipjack fishery. The result has been the convergence of both normative and functional leverage (Symes ) of the PNA as a negotiating body within the WCPFC. However, it also raises questions about whether these arrangements are replicable at similar sub-regional scales within the WCPO and in other RFMOs, or if they are specific to the context of the PNA. Indeed, the power of cooperation through the PNA’s current position to act as a coherent and notably powerful unit when interacting regionally through the WCPFC has not been lost on other Pacific Island countries. Two additional sub-regional groupings in the Pacific, the Melanesian Spearhead Group Fisheries Technical Advisory Group and the Te Vaka Moana arrangement between certain Polynesian states and a group of countries in Indian Ocean, have shown interest in replicating the PNA model. The emergence of these new groupings points to the value that can be gained from fishery sub-regionalisation, bringing together a single functional area and natural phenomena (Symes ). However, such groups within the WCPO are unlikely to achieve the same kind of leverage with the WCPFC because of the smaller proportion of fish under their control – the MSC certification accounts for 70 per cent of the tuna stock in its combined EEZ (PNA ). In the Indian Ocean they are less likely due to the more open geography of national EEZs. As we now go to argue, creating concordance between functional, jurisdictional and natural scales can facilitate a process of sub-regionalisation but will not automatically lead to successful political and functional integration into larger multilateral institutions. Although fundamentally different in aim and legal set-up, the normative structures of the WCPFC and the PNA have produced a creative interplay for tuna management. The RFMO structure is legislated through UNCLOS, which mandates the inclusion of DWFNs. The explicit governance objective at this level is therefore not about furthering the interests of member states but fulfilling the broader conservation and resource management requirements. The RFMO system is therefore designed to create an up and out ‘double movement’ which manages the interests of historical fishing rights of port and flag states, rather than a down and out movement designed to stimulate functional subsidiarity (cf. Hegland et al. ). At this level, no project exists to decentralise formal and functional control to sub-regions because there is no political will of the member countries at the WCPFC level. In contrast the PNA has created an opposite ‘double movement’ akin to that seen in the last round of the EU CFP reforms (Raakjaer and Hegland ); a reduction in the number of states involved in the decision making and the promotion of conservation and management measures up to the WCPFC. As such, the PNA is structured as an exclusive bottom up coalition excluding external actors from governance decisions. Again reflecting a process of sub-regionalisation, and in contrast to the WCPFC, the PNA is explicitly working to further the interests of its members in the face of pressure from DWFNs seeking access to tuna resources. Through this, they are aiming to capture development benefits, equity and justice for members by promoting sustainable tuna fishing. This is illustrated by the exclusion of Philippine vessels to the high seas pockets now controlled by the PNA, despite the Philippines being a WCPFC member with mandated access. Moreover, the MSC certification allows the member countries of the PNA to pursue national interests within a collective strategy of market-driven sustainability (cf. Hanich et al. ). The strategy of the PNA to have their free school skipjack fishery certified therefore plays an important role in supporting its internal normative structures. While the recognition of the PNA’s capacity for producing innovative conservation and management strategies is evidenced by the uptake of these measures at the WCPFC level, gaining MSC certification also adds further recognition to the powerful position the PNA holds globally and increases the legitimacy of its governance (See for example Gulbrandsen ). Strategically, the certification also adds market value to the PNA skipjack tuna, connecting the PNA to powerful external markets like the EU and the US, further ensuring member countries’ economic stronghold over this part of the tuna resource. This illustrates that as both a market actor and sub-regional governance body, the PNA now plays a strong functional role in the WCPO governance architecture. In spite of the different structures and objectives, both governance bodies focus on multilateral engagement to produce cooperative arrangements that reduce the complexity of negotiations over and between multiple interests in tuna fisheries. The interplay of these normative structures between levels greatly influences both the sub-regionalisation of fisheries management and the political regionalism of the PNA and WCPFC. On the one hand, the PNA are feeding innovative management measures from the bottom up, where shared socioeconomic interests allow the body to ‘speak in one voice’. On the other hand, scrutiny of these measures within the WCPFC provides top down oversight and legitimacy. Therefore, while these bodies are fulfilling different roles one could not replace the other. They reinforce a creative tension through their interplay that would not be possible should only one level exist and are as such mutually dependent on each other for management innovation. As a region characterised by small island developing states, the process of sub-regionalisation allows for collective authority and strategic capacity to be generated among countries whose individual capacity in strategic analysis and strategy development is otherwise limited both nationally and when negotiating under a wider regional regime (Hanich ). Our results show that balancing the diversity of interests through an active process of fisheries regionalism by the PNA is strategic and closely related to negotiating a more equitable distribution of the conservation burden in international fora like the WPCFC. We therefore discuss the two evaluative criteria of tension between converging/diverging interests and benefit distribution together. In spite of playing an instrumental role in the creation of the WCPFC, its presence as the highest governing body within the region has seen the Pacific Island countries consolidate their position as a sub-regional group, which is less open to outside, country by country, negotiation over access. As opposed to the partnership-oriented approach intended by RFMO level governance, the PNA have placed more of a focus on internally controlled implementation, treating DWFNs increasingly as licensees. The proactive role of the PNA in searching for innovative ways to control the WCPO tuna fishery also provides an indication of underlying regional political tensions. As outlined by Aqorau (), the PNA’s response is a direct challenge to DWFNs that are seen as “intent on vitiating the gains the PNA have made through the VDS” (Aqorau , p.599). This can be seen as an on-going exercise in capturing control over tuna fisheries that was lost in previous attempts to reduce licence numbers under the Palau agreement and increased power of the DWFNs under the WCPFC Convention. In turn this is illustrated by the PNA’s shift from imposing a cap on vessel numbers to fishing days just after the WCPFC emerged, thereby strengthening their management and control over access agreements (Havice ). Although criticised for its lack of transparency in allocating vessel days, and for consistently exceeding the number of days apportioned, the control the PNA nations exercise over fishing effort within limits consistent with resource sustainability both put in place a stronger identity of the PNA as a management region, while also putting the associated countries in a powerful position to secure control over DWFNs represented at the WCPFC. The PNA’s success in shaping these broader governance processes is still however, a relatively new aspect of the overall WCPO governance architecture. While the PNA itself has been around for a long time, it has only really presented a demonstrable challenge to the status quo of regional-level governance since 2008. Therefore, the longevity of this kind of governance interplay is unknown. While strategic interactions between the different levels illustrate the value of sub-regionalisation in WCPO tuna fisheries governance, it is dependent on the PNA either retaining their position as a unified group or face what has been referred to in other trans-boundary governance regimes as fragmentation (e.g. Biermann et al. ). For instance, this is being challenged by Kiribati’s negotiations with the EU over their fisheries partnership agreement. In these negotiations, the EU has insisted that the three year protocol granting access to 10 EU fishing vessels (four purse seiners and six longliners), does not incorporate the VDS (EU Committee on Fisheries ). This agreement would see Kiribati essentially defecting from the conditions set out by the VDS. Additionally, by insisting on remaining outside the VDS, the EU is maintaining a relatively low access fee that distorts the regional market for access to the tuna fishery. This case demonstrates both the strength and weakness of fishery regionalism in the PNA. It also shows the change in strategy required by the DWFN members of the WCPFC who are marginalised by the powers of exclusion now exercised by the PNA through their conservation and management measures. Therefore, given the additional importance of DWFNs’ fishing interests, the WCPFC provides a critical venue for enforced cooperation amongst its member. This makes governance at the regional level far from redundant. The complex mosaic of jurisdictions in the region means that the challenges that the FFA, PNA and the WCPFC have faced so far will be compounded over the coming years as they come under increasing pressure to respond to over-fishing and over-capacity concerns (Hanich ), the rise of other emerging regional groupings staking their own claims and changes in negotiation strategies by DWFNs. The performance of tuna fisheries governance in the WCPO is increasingly determined by the interplay between regional and sub-regional bodies responsible for designing and implementing conservation and management measures. Sub-regionalisation appears to be a means for overcoming the limitations of large international environmental regimes. However, distributing management functions over geographical scales is only likely to be effective if there is a mix of political will and multilateralism that can create cooperation for sustainable management and reduce competition. In the case of the WCPO, the sub-regional PNA supported higher levels of governance through the creation of the WCPFC, but have since started to reassert themselves and their governance capacity. The case illustrates that for contested marine resources such as fisheries, international sub-regions can go beyond functional units to also present wider opportunities to shift power relations in the favour of small island states. The PNA has emerged in a strong position to innovate management measures that would not otherwise be possible at the more inclusive WCPFC level. This strength has led some to describe the PNA as a “tuna cartel” with the WCPO becoming the “Saudi Arabia of Tuna” (Brian Jeffries quoted in Aqorau  p.581). The skipjack fishery most clearly demonstrates this ‘cartel’: it illustrates how functional regionalisation can lead to a wider regionalism of fisheries management, which in turn can lead to positive interplay between levels of governance. MSC certification of the PNA free school tuna fishery provides an added layer of legitimacy to the PNA management measures and indirectly the PNA as a fishery region. But although the MSC appears to play a role in supporting fisheries regionalism, it remains unclear as to whether it offers a strong long term strategy for consolidating cooperation between the member states. Should economic benefits not accrue to these states, defection rather cooperation may prove to be the outcome. This case contributes a more nuanced understanding to the perceived crisis of multilateralism by identifying how new forms of regionalism can contribute to solving complex environmental problems. Far from complicating the process of governance and decision-making, the presence of sub-regional groups like the PNA have the potential to constructively challenge higher scale regional groupings like the WCPFC. The combined work of the PNA and the WCPFC may represent a testing ground for a functional multilateralism based on shared resources and utilising both regional and sub-regional governance platforms. However, at least in fisheries, but also in other resource sectors, the question remains whether and how other regional/sub-regional arrangements can emerge that that can take into account the complex social and ecological interactions to promote sustainable production, waste or conservation practices.